"Overall, the results show how divorced Facebook’s user behavior is from the day-to-day news coverage blasting it for allowing Russian interference in US elections and for making us unhealthy zombie browsers. ComScore and Nielsen claim time spent on Facebook per U.S. user is declining, and that showed up in the daily user count growth, but Facebook seems to be making up for that in international monthly user growth and squeezing more dollars out of each ad. With the Snapchat threat largely neutralized via Instagram, Facebook’s biggest enemy is itself. Now it has to work to preemptively disarm any future privacy crises or other scandals, and co-opt the “Time Well Spent” rallying call before it becomes a “Time to leave Facebook” movement." Now a new group of investors is also betting that Asana can be part of the solution. The startup plans to announce Tuesday it has raised $75 million in venture funding, in a round led by Al Gore’s Generation Investment Management. Other investors include 8VC, Peter Thiel’s Founders Fund, Y Combinator President Sam Altman and Moskovitz himself." "Make no mistake: Digital rights management is a real issue for photographers, and the blockchain does, in theory, offer a compelling solution. But the specific attributes of KodakCoin present some red flags. First, despite the name, KodakCoin is not actually a Kodak project. The company behind the offering, WENN Digital, is a California-based affiliate of a British photo agency that specializes in paparazzi photo licensing. Under their licensing agreement, Kodak will not receive any direct revenue from the public offering. It will receive a minority stake in WENN Digital, 3 percent of all KodakCoins issued and a royalty on future revenue." "Xerox, an icon of corporate America that pioneered the office copy machine as well as the graphic interface and mouse used with today’s computers, only to be blindsided by the digital revolution, is coming under Japanese control. The company said on Wednesday that it would combine its operations with its joint venture with Fujifilm Holdings of Japan. Fujifilm would own just over 50 percent of the business, which would aim to cut $1.7 billion in costs in coming years. The deal would bring to an end Xerox’s 115 years as an independent company. Its copy machines were once so popular that the word “Xerox” became a ubiquitous verb for making copies, whether on one of its machines or on those of its rivals." "Ads are the lifeblood of the internet, the source of funding for just about everything you read, watch and hear online. The digital ad business is in many ways a miracle machine — it corrals and transforms latent attention into real money that pays for many truly useful inventions, from search to instant translation to video hosting to global mapping. But the online ad machine is also a vast, opaque and dizzyingly complex contraption with underappreciated capacity for misuse — one that collects and constantly profiles data about our behavior, creates incentives to monetize our most private desires, and frequently unleashes loopholes that the shadiest of people are only too happy to exploit." "Socially, politically and culturally, the online ad business is far more dangerous than I appreciated. Mr. Cook was right, and we should have listened to him." "From my point of view, there is no fundamental reason that machines could not, in principle, someday think, be creative, funny, nostalgic, excited, frightened, ecstatic, resigned, hopeful, and, as a corollary, able to translate admirably between languages. There’s no fundamental reason that machines might not someday succeed smashingly in translating jokes, puns, screenplays, novels, poems, and, of course, essays like this one. But all that will come about only when machines are as filled with ideas, emotions, and experiences as human beings are. And that’s not around the corner. Indeed, I believe it is still extremely far away. At least that is what this lifelong admirer of the human mind’s profundity fervently hopes. When, one day, a translation engine crafts an artistic novel in verse in English, using precise rhyming iambic tetrameter rich in wit, pathos, and sonic verve, then I’ll know it’s time for me to tip my hat and bow out." "The social networking giant said Tuesday that it will not display ads for financial products that “are frequently associated with misleading or deceptive promotional practices,” specifically virtual currencies and “initial coin offerings,” a fundraising tactic that new cryptocurrencies use to attract fresh investors. “We want people to continue to discover and learn about new products and services through Facebook ads without fear of scams or deception,” wrote Rob Leathern, a product management director at Facebook, in a blog post." "Amazon, Berkshire Hathaway and JPMorgan Chase announced on Tuesday that they would form an independent health care company for their employees in the United States. In a statement, chief executives at the three corporate behemoths expressed their frustration with the nation’s expensive, often confusing health care system. The news added further uncertainty to an industry already reeling from attempts by new players to attack a notoriously inefficient, intractable sector. The lines between traditionally distinct areas, such as pharmacies, insurers and providers, are increasingly blurring." Intel has been advising PC makers and customers to simply stop updating their firmware right now, until properly tested updates are available. Microsoft has gone a step further, and is issuing a new software update for Windows 7, Windows 8.1, and Windows 10 systems to disable protection against Spectre variant 2. Microsoft says its own testing has found that this update prevents the reboots that have been occurring." Check the full post for a Teams feature update. If you're using macOS and want to explore the latest features, try Teams via Firefox; the macOS native Teams app hadn't been updated as I typed this (the Windows native app had been updated) [update ~12 hours later: new macOS Teams app has been released], and Safari isn't supported (it reports "Microsoft Teams will be available on Safari very soon! In the meantime, try out our desktop app. "); Teams in macOS Chrome advises "D'oh! To open the web app, you need to change your browser settings to allow third-party cookies." "New features in Microsoft Teams make it an even more powerful hub for teamwork by enabling you to use apps in new ways—including the ability to command apps and take quick actions from the command box, as well as include content from an app in a conversation. This marks the biggest single release of new functionality since Teams launched last March." "Dell Technologies could emerge as a public company through a reverse-merger with VMware, the $60 billion cloud computing company it already controls, according to people familiar with the matter. The reverse merger, whereby VMware would actually buy the larger Dell, would then allow Dell to be traded publicly without going through a formal listing. It would also likely be the biggest deal in tech industry history, giving investors who backed Dell's move to go private in 2013 a way to monetize their deal, while helping Dell pay down some of its approximately $50 billion debt." The change comes as Facebook grapples with the aftermath of the Russian disinformation campaign during and after the 2016 presidential election. The company said it is trying to improve the quality of news that readers see on Facebook and to offer users more posts from people they know." "At the age of 6, a child is full of imagination and may not distinguish reality from fantasy. She is beginning to read and can’t grasp nuances in written communication. She also doesn’t understand privacy. Citing those reasons and more, dozens of pediatric and mental health experts are calling on Facebook to kill a messaging service the company introduced last month for children as young as 6." "U.S. regulators and the wireless industry are pushing back against a plan under discussion by the Trump administration to build a secure 5G network — possibly with government control — amid concerns about China and cybersecurity. The Republican head of the Federal Communications Commission also issued a statement in opposition to any government control, suggesting that the wireless industry is best positioned "to drive innovation and investment." "I oppose any proposal for the federal government to build and operate a nationwide 5G network," said FCC Chairman Ajit Pai, who was appointed by President Trump. "Any federal effort to construct a nationalized 5G network would be a costly and counterproductive distraction from the policies we need to help the United States win the 5G future."" "For years, I’ve been saying Steven Pinker’s The Better Angels of Our Nature was the best book I’d read in a decade. If I could recommend just one book for anyone to pick up, that was it. Pinker uses meticulous research to argue that we are living in the most peaceful time in human history. I’d never seen such a clear explanation of progress. I’m going to stop talking up Better Angels so much, because Pinker has managed to top himself. His new book, Enlightenment Now, is even better." "While Bitcoin and its ilk have recovered from their selloff on Friday -- thanks in part to Coincheck’s assurances over the weekend that customers would be partially reimbursed -- market observers say concerns over security lapses at cryptocurrency exchanges are likely to persist. They may even push some investors toward peer-to-peer methods of trading that don’t rely on centralized platforms. “The latest theft will have two immediate effects: more regulation by authorities over exchanges and more recognition of the advantages offered by decentralized ways of trading,” said David Moskowitz, co-founder of Indorse Pte in Singapore, which runs a social network for blockchain enthusiasts." "Ultimately, the Strava map demonstrates the need for user awareness of the nature of the information that a device reveals to the outside world. While a single user might use the app for one particular activity, massive volumes of this information paint a revealing picture of a group’s activities. As the government and military work to evaluate and contend with potential security flaws, it’ll be up to the people using the app to be mindful of how they’re using their devices." By essentially using crypto trading as a loss leader instead of its primary business like Coinbase and other apps, Robinhood could substantially expand beyond the 3 million users it already has. Simplifying trading and tracking could bolster Bitcoin and Ethereum. And by combining it with traditional stock, ETF, and option trading in a single app, Robinhood could further legitimize the cryptocurrency craze. The two trading worlds could cross-pollinate, dragging even more people into the crypto scene." Article summary: "The technology will be better than fire; lead to World War III"
"AI is going to be more important than humanity’s mastery of fire or electricity, Google CEO Sundar Pichai said. Alibaba founder Jack Ma warned that AI and robots are going to "kill a lot of jobs" and could start a third world war. "Each technology revolution has made the world unbalanced," Ma said. Kai-Fu Lee, the former China head at Google, talked up a different sort of existential AI threat: the fear of missing out. Executives shouldn’t let human-resources departments tell them they can’t afford the high salaries AI experts command. "You’ve got to break the scale for at least one person" with the right know-how, he told them. IBM’s Ginni Rometty invoked Karl Marx, telling her fellow corporate leaders that they had an obligation to "prepare the workers of world for this revolution."" "Founder and Chief Executive Officer Michael Dell took his company private in 2013, when he teamed up with Silver Lake Management LLC on a leveraged buyout. That freed Dell to cut costs and work to become a bigger supplier of hardware and software for corporate data centers without the quarterly investor scrutiny that comes with being a public company. Three years later, Dell acquired storage-technology provider EMC Corp. and its majority stake in data-center software vendor VMware, taking on a massive debt load to seal the $67 billion deal. Raising cash could help the company further expand or pay off some of the debt. Dell Technologies has about $46 billion of debt, according to data compiled by Bloomberg. That includes about $3 billion of bonds maturing in 2018 and $4.35 billion due next year while the company also has loans outstanding, the data shows. Another option is to buy the rest of VMware that Dell does not already own, said one person familiar with the matter. VMware shares have risen more than 60 percent in the past year." "Walmart customers will be able to read the books through Rakuten Kobo e-reading devices — which have not taken hold with Americans the way Amazon’s Kindle and Barnes & Noble’s Nook have. The partnership is part of Walmart’s effort to ensure that its online offerings include every conceivable product line, giving shoppers no reason to click over to Amazon. But by many measures, Walmart is arriving late to the digital book party. Amazon, which built its business around book sales in its early days, has a huge head start. Beyond that, the e-book market has shown signs of fizzling, as screen-weary readers turn back to print copies." "It seems nearly every company at Davos is looking at blockchain technology – whether its banks that stand to be bypassed by payments linked to blockchain, or insurance companies which could create smart contracts for any risk, or even food companies which could secure their supply chains. At Davos, prime ministers, central bankers and regulators have left no doubt that they’re not going to let the bubble go on without regulation. They have used the most important gathering of financial and government leaders in the world to send a big message – the Wild West-era of cryptocurrencies is over. “We do not want them to get too big and too widely traded in China,” Fang Xinghai, vice-chairman of the China Securities Regulatory Commission told a session titled “The Next Financial Crisis.” He said he supported “wholeheartedly” the prospect of the Chinese central bank shutting down bitcoin exchanges." "Facebook and Google have become “obstacles to innovation” and are a “menace” to society whose “days are numbered”, said billionaire investor and philanthropist George Soros at the World Economic Forum in Davos on Thursday. “This is particularly nefarious because social media companies influence how people think and behave without them even being aware of it. This has far-reaching adverse consequences on the functioning of democracy, particularly on the integrity of elections.”"
"AWS has purchased Sqrrl, a Cambridge, Mass. security startup with roots in the NSA. The company helps analyze a variety of sources to track and understand security threats quickly using machine learning. The announcement appeared on the Sqrrl home page in note from company CEO Mark Terenzoni. “We’re thrilled to share that Sqrrl has been acquired by Amazon. We will be joining the Amazon Web Services family, and we’re looking forward to working together on customer offerings for the future,” he wrote. The question in these types of purchases is what happens to the customers. The statement suggested that at least for the time being, Sqrrl will continue to work with its existing customers." "Apple Inc. is ready to take on Amazon.com Inc. in the digital book market again, years after regulators forced the iPhone maker to back down from an earlier effort to challenge the e-commerce giant’s lead. Apple is working on a redesigned version of its iBooks e-book reading application for iPhones and iPads and has hired an executive from Amazon to help. The new app, due to be released in coming months, will include a simpler interface that better highlights books currently being read and a redesigned digital book store that looks more like the new App Store launched last year, according to people familiar with its development. The revamped app in testing includes a new section called Reading Now and a dedicated tab for audio books, the people said." "The change in leadership highlights the rapid advancement of AI at Facebook — and how far it still needs to go. He said Facebook’s team of roughly 100 AI researchers was a small fraction of the team at Google or Microsoft and far more limited in its scope. “This is the Red Queen hypothesis,” he said, referring to a concept in evolution. “It’s not how fast you’re running but, in a relative sense, how fast you’re running compared to everyone else.”"
Berlin-based IOTA was founded in 2015 to provide secure payments and communications between machines on the Internet of Things (IoT). IOTA doesn’t run on blockchain at all but a new ledger called the “tangle,” which is growing fast in popularity. While blockchain runs on a single chain of “blocks,” the tangle operates across multiple structures, designed to overcome many of blockchain’s challenges, such as scalability. At this stage, whether it’s the better distributed ledger is hard to determine." "My recent Apple Store observation is not an isolated incident. More people are buying Apple Watches these days. During the three quarters leading up Apple's FY1Q18, Apple Watch unit sales have been up at least 50 percent year-over-year. From a unit sales perspective, this works out to Apple Watch sales trending at a little less than 20M units on an annual basis. In what will come as a surprise to most people, Apple Watch likely outsold Amazon Echo during the holidays despite Apple Watch selling for nearly 10x more money. Based on unit sales, the Apple Watch business is currently about the size of the Mac business. When considering that the Apple Watch is less than three years old, for the product to be nearly outselling Mac on an annual basis is quite the achievement. As seen in the chart below, assuming Apple is able to maintain Apple Watch sales momentum, the sales gap between Apple Watch and iPad will continue to narrow." "HomePod is one of the most interesting new Apple products in years, insofar as I really don’t know how it’s going to sell. If most people see it as a direct competitor to Amazon Echos and Google Home dinguses, HomePod might be in trouble, because it’s a lot more expensive and has fewer features. But Apple has been positioning it as, first and foremost, a high-quality music player. The Siri-as-personal-assistant/smart-home-controller is secondary to audio quality. If there’s a market for that, HomePod could clean up. $350 is a low price in the audio world." "The Falcon Heavy briefly roared to life for the first time at Nasa’s Kennedy Space Center. All three boosters – 27 engines in all – were tested. The thunderous booms could be heard at the press site three miles away, as huge white clouds of engine exhaust billowed into a clear blue sky. Everything appeared normal: the 230ft (70-meter) rocket stood tall and brilliantly white after the test on the historic pad once used by Nasa’s Apollo moon rockets and space shuttles. The SpaceX chief executive, Elon Musk, said an hour later that the firing was good. “Generated quite a thunderhead of steam. Launching in a week or so,” he said via Twitter." "HomePod, the innovative wireless speaker from Apple, arrives in stores beginning Friday, February 9 and is available to order online this Friday, January 26 in the US, UK and Australia. HomePod will arrive in France and Germany this spring. HomePod delivers stunning audio quality wherever it’s placed — in any room in the house, playing any style of music. Using just your voice, it’s easy and fun to use, and works together with an Apple Music subscription for a breakthrough music experience, providing access to one of the world’s largest cloud music libraries. Siri, now actively used on over half a billion devices, has developed a deep knowledge of music and understands your preferences and tastes. And with Siri, HomePod can send a message, set a timer, play a podcast, check the news, sports, traffic and weather, and even control a wide range of HomeKit smart home accessories." "Stripe, which four years ago said it would become the first major online payments platform to accept bitcoin for payments, is ditching the idea. The company said Tuesday that the cryptocurrency had almost become a victim of its own popularity — the time needed to complete a transaction has increased, meaning that payments sometimes fail. And the rise in transaction fees helped convince Stripe that bitcoin is meant to be more of an asset and less of a currency for daily payments. “By the time the transaction is confirmed, fluctuations in bitcoin price mean that it’s for the ‘wrong’ amount,” Stripe’s Tom Karlo said. “For a regular bitcoin transaction, a fee of tens of U.S. dollars is common, making bitcoin transactions about as expensive as bank wires.”"
"The startup, which has raised at least $4 million, will join Facebook’s office in Boston. A Facebook spokesperson confirmed that the acquisition was intended to help “support our ongoing efforts to keep our community safe,” but declined to elaborate further. Why is Facebook buying technology to verify your driver’s license? Facebook will sometimes ask users to send in formal identification if they are locked out of their account, so it’s possible the technology will help with those efforts. Facebook has a strict policy around using your “authentic name” — a policy that’s meant to ensure people aren’t creating anonymous accounts or impersonating somebody else, but also requires Facebook to actually confirm users’ identities from time to time." 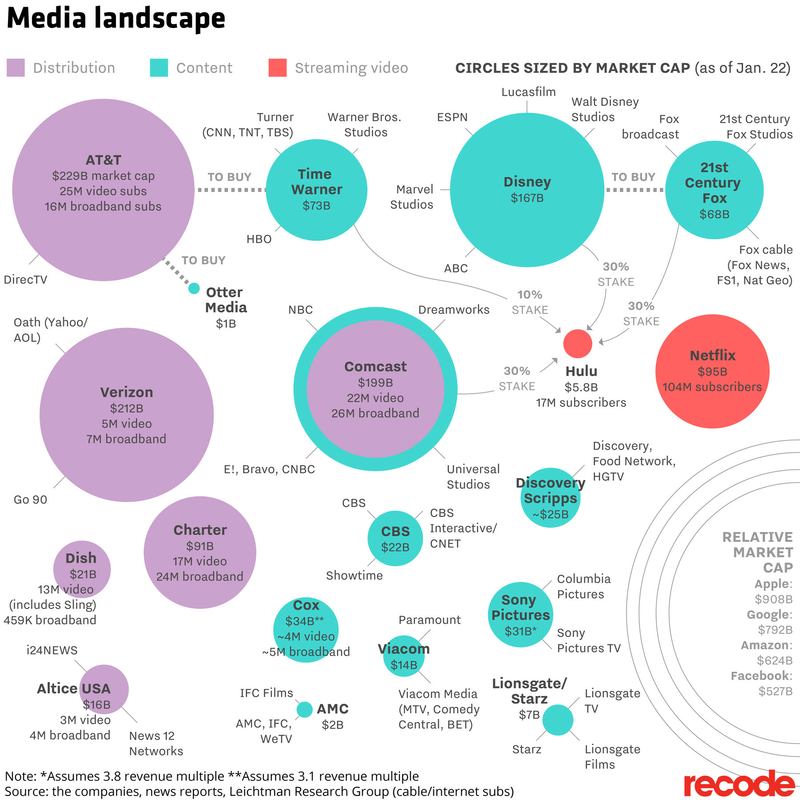 "The media landscape used to be straightforward: Content companies — studios — made stuff — TV shows and movies — and sold it to pay TV distributors, who sold it to consumers. Now things are up for grabs: Netflix buys stuff from the studios, but it’s making its own stuff, too, and it’s selling it directly to consumers. That’s one of the reasons older media companies are trying to compete by consolidating. And new distributors like Verizon and AT&T are getting in on the action. AT&T, for instance, wants to merge with Time Warner. Meanwhile, giant tech companies like Google, Amazon and Apple that used to be on the sidelines are getting closer and closer to the action." "Jérôme Pesenti, former chief executive officer of AI startup BenevolentTech and before that a leader of International Business Machines Corp.’s Watson platform, will succeed Yann LeCun. LeCun, a prominent academic who started the group at Facebook years ago, retains a leadership role as the social media company’s chief AI scientist. The website Quartz earlier reported the management change. The hiring of Pesenti, who has a more managerial background, may indicate that Facebook is looking to step up the application of its artificial intelligence research in its business, rather than just focusing on the academic exploration of the science. Facebook is trying to rely more on AI to help it spot and remove photos and videos that violate its policies, for example, instead of waiting for users to flag troublesome content. A Facebook spokesman said LeCun will still "set the scientific agenda for the group."" "I don’t seek to minimize real struggles, much less the real displacement that will come from technologies like Amazon Go writ large. For decades technology helped the industrial world work better; more and more, technology is replacing that world completely, and there will be pain. That, though, is precisely why it is worth remembering that the world is not static: to replace humans is, in the long run, to free humans to create entirely new needs and means to satisfy those needs. It’s what we do, and the faith to believe it will happen again will be the best guide in figuring out how. As for Amazon, the company’s goal to effectively tax all economic activity continues apace. Surely the company is grateful about the attention Facebook is receiving from the public, even as it builds a monopoly with a triple moat. The lines outside Amazon Go, though, are a reminder of exactly why aggregator monopolies are something entirely new: these companies are dominant because people love them. Regulation may be as elusive as Marx’s revolution." "After providing a disappointing earnings outlook last week, "Big Blue" now makes up about 0.6 percent of the S&P 500 and has sunk to 35th in the index, according to FactSet. Howard Silverblatt, a senior index analyst at S&P Dow Jones Indices, said it's the lowest IBM has been in his four decades following the market at S&P. While investors have been pouring money into tech mega-cap companies like Alphabet, Amazon and Microsoft, even showing some enthusiasm of late for Cisco, Intel and Oracle, they've given IBM a giant shrug. Of the 10 most valuable U.S. tech companies, only IBM is down over the past year. Intel, the next worst performer among the group, has gained 24 percent, and the S&P 500's technology index has jumped 42 percent." He predicts forking may soon sideline a more popular alternative, initial coin offerings, in which startups raise money by selling entirely new tokens. That market has gotten crowded after raising about $3.7 billion last year, and smaller offerings have struggled." "Mr. Musk has often said he is not driven by money. So what is it about this incentive plan that appeals to him? “I want to contribute as much as possible to humanity becoming a multi-planet species,” he said, alluding to a goal he has talked about often, including having people live on Mars. “That obviously requires a certain amount of capital.”"
Later in the article: "Fundamentally, the problem is that “disinformation campaigns and legitimate advertising campaigns are effectively indistinguishable on leading internet platforms, ” Mr. Ghosh and Mr. Scott wrote." "A few months later, Mr. Ghosh quit his job at Facebook, where he worked on privacy and public policy issues. On Tuesday, a Washington think tank, New America, and Harvard’s Berkman Klein Center for Internet and Society published a report he co-wrote, asserting that technology behind digital advertising — the financial lifeblood of Facebook, Google and Twitter — has made disinformation campaigns more effective. “The problems were much broader than we imagined, and it was not just about one tool or platform,” said Mr. Ghosh, who with his co-author, Ben Scott, worked on devising Mrs. Clinton’s tech policy platform. “It’s the profit model underlying the whole digital advertising system.”"
The central core was redesigned and reinforced to handle the stresses, one of the key reasons that the Heavy is more than three years behind schedule. While the two side boosters are reused from earlier Falcon 9 launches, the core is all new, as is the second stage." "Google’s search engine and its news-aggregation service have been criticized for showing misleading answers and distributing false stories online. Meanwhile, YouTube is facing one of the worst crises in its roughly 18-year existence after advertisers found their marketing messages running alongside extremist and offensive videos. YouTube has also been swept up in investigations into whether Russia used social media to influence the 2016 presidential election. "All of us are obviously very upset that somebody could have influenced the election," Pichai said. However, he warned that it’s difficult for such a large company to decide what is true or false. "Drawing the line is becoming increasingly hard," he said. "We’re a global company. We operate in many countries. People disagree."" See Hard Questions: Social Media and Democracy (Facebook Newsroom) for more details; also see Cass Sunstein's essay, Guest Post: Is Social Media Good or Bad for Democracy? (Facebook Newsroom), which begins "On balance, the question of whether social media platforms are good for democracy is easy. On balance, they are not merely good; they are terrific. For people to govern themselves, they need to have information. They also need to be able to convey it to others. Social media platforms make that tons easier." Following the November 2016 election, Menlo Park, California-based Facebook has frequently promised to work harder and devote more resources to fixing such issues. But it also usually emphasized that bad actors made up a small percentage of activity and that, overall, the company was doing something good for society. Facebook’s post today is the most self-critical assessment of the company’s impact to date, complete with an admission that its efforts may not be successful." "Cook's nephew will soon be a teenager. The minimum official age to have a Facebook account is 13, yet some have said for years that this is regularly flouted. Some estimates have put Facebook participation among under-13s at 7.5 million. A recent UK study showed that 51 percent of 12-year-olds and 28 percent of 10-year-olds have a social media profile. In December, perhaps to address this reality, Facebook launched a Messenger Kids app specifically for the under-13s." "In the virtual currency world this creation process is called “mining.” There is no physical digging, since Bitcoins are purely digital. But the computer power needed to create each digital token consumes at least as much electricity as the average American household burns through in two years, according to figures from Morgan Stanley and Alex de Vries, an economist who tracks energy use in the industry. The total network of computers plugged into the Bitcoin network consumes as much energy each day as some medium-size countries — which country depends on whose estimates you believe. And the network supporting Ethereum, the second-most valuable virtual currency, gobbles up another country’s worth of electricity each day." "But what’s most telling about today’s announcement is that Facebook remains insistent on arguing that it’s not really in a position to make judgements about the stuff it shows its two billion users — someone else needs to do it. “The hard question we’ve struggled with is how to decide what news sources are broadly trusted in a world with so much division,” Zuckerberg writes in a blog post today. But to be clear, it’s not because the people who work at Facebook, who build their own internet-beaming drones, aren’t smart enough to figure out the difference between the New York Times and the Denver Guardian, which doesn’t actually exist. It’s that they don’t want to do it, Zuckerberg says. ”We could try to make that decision ourselves, but that’s not something we’re comfortable with.”"
"A year ago, before the investor lawsuits and the federal investigations, before the mass resignations, and before the connotation of the word “Uber” shifted from “world’s most valuable startup” to “world’s most dysfunctional,” Uber’s executives sat around a hotel conference room table in San Francisco, trying to convince their chief executive officer, Travis Kalanick, that the company had a major problem: him." "In a strongly worded letter to the heads of the Securities Industry and Financial Markets Association and the Investment Company Institute, the director of the division of investment management, Dalia Blass said that there were “significant outstanding questions” around how funds that held large amounts of cryptocurrencies (and related products) would satisfy the necessary regulatory requirements. In the letter Blass identified a number of areas of concern for the regulatory agency including the valuation of underlying cryptocurrency assets held by mutual funds or exchange traded funds; the actual liquidity of the assets that these funds would hold; the institutions that would provide custodial oversight for the assets; and the exposure of the assets to both market manipulation and trading arbitrage." "Google has previously said that agreements such as these reduce the potential of litigation over patent infringement. Tencent oversees China’s top social media and payments app, WeChat, which has close to a billion users. It also oversees one of the country’s most popular app stores and hosts the country’s biggest gaming and livestream platforms." See IBM Reports 2017 Fourth-Quarter and Full-Year Results (IBM newsroom) for cloudy accounting details such as "Cloud revenue over the last 12 months was $17.0 billion, including $9.3 billion delivered as-a-service and $7.8 billion for hardware, software and services to enable IBM clients to implement comprehensive cloud solutions" and creative "cognitive" categorization, e.g., "Cognitive Solutions (includes solutions software and transaction processing software)"
"In a statement, Ms. Rometty noted the strong growth in the new businesses, which IBM collectively calls “strategic imperatives” and now represent 46 percent of the company’s revenue. “We are pleased with our overall revenue growth in the quarter,” she said. Company executives said they expected revenue growth to continue throughout 2018. In after-hours trading, IBM shares fell 3.5 percent. The company’s shares had risen nearly 10 percent this year, and some investors were apparently expecting stronger results." "But big tech platforms, particularly Facebook, Google and Amazon, do indeed raise a worry about fair competition. That is partly because they often benefit from legal exemptions. Unlike publishers, Facebook and Google are rarely held responsible for what users do on them; and for years most American buyers on Amazon did not pay sales tax. Nor do the titans simply compete in a market. Increasingly, they are the market itself, providing the infrastructure (or “platforms”) for much of the digital economy. Many of their services appear to be free, but users “pay” for them by giving away their data. Powerful though they already are, their huge stockmarket valuations suggest that investors are counting on them to double or even triple in size in the next decade. There is thus a justified fear that the tech titans will use their power to protect and extend their dominance, to the detriment of consumers (see article). The tricky task for policymakers is to restrain them without unduly stifling innovation." "Office for iPad, when it initially shipped in 2014, made use of the converged codebase as of the second release in 2017, as did Office for Android, Office for Win32 and, as of January 18, Mac Office. While Microsoft isn't promising 100 percent feature parity across its various Office flavors, officials say the shared cross-platform code means Microsoft should be able to light up new Office features more quickly and closer to simultaneously. And customers who use Office on different platforms should see more fidelity across the versions as a result of this work." "Having bet on Amazon cloud services and pushed the shares past $1,300, investors are now salivating about the ad business, which doesn’t require big investments in new data centers or shipping hubs and generates fat margins. On Monday, BMO Capital Markets upped its Amazon price target to $1,600 a share, based largely on the growth of the ad business. Some analysts are predicting Amazon will reach $2,000, making it the first company with a $1 trillion market value. “Advertising is the most profitable business in the world,” says Jay Kahn, a partner at Light Street Capital, who notes that Chinese e-commerce giant Alibaba Group Holding Ltd. gets more than half its revenue from ads. “For Amazon, advertising is going to be more profitable than its cloud business.” Amazon declined to comment." "The technology is limited for now, but it could be the start of something big. Building and optimizing a deep neural network algorithm normally requires a detailed understanding of the underlying math and code, as well as extensive practice tweaking the parameters of algorithms to get things just right. The difficulty of developing AI systems has created a race to recruit talent, and it means that only big companies with deep pockets can usually afford to build their own bespoke AI algorithms. “We need to scale AI out to more people,” Fei-Fei Li, chief scientist at Google Cloud, said ahead of the launch today. Li estimates there are at most a few thousand people worldwide with the expertise needed to build the very best deep-learning models. “But there are an estimated 21 million developers worldwide today,” she says. “We want to reach out to them all, and make AI accessible to these developers.”"
"For five and a half years, nearly the entire tenure of its chief executive, Virginia M. Rometty, IBM has reported a steady erosion of revenue. Selling off its chip manufacturing and smaller data-center computer businesses contributed to the decline. So, too, did the fact that new businesses like cloud computing, data analytics and artificial intelligence had not yet grown big enough to make up for the downturn in IBM’s traditional hardware and software products. But IBM’s half-decade losing streak will most likely end on Thursday, analysts predict, when the company reports its quarterly performance." "All of this leads us to what may be one of the most important conclusions of all. Skilling-up for an AI-powered world involves more than science, technology, engineering and math. As computers behave more like humans, the social sciences and humanities will become even more important. Languages, art, history, economics, ethics, philosophy, psychology and human development courses can teach critical, philosophical and ethics-based skills that will be instrumental in the development and management of AI solutions. If AI is to reach its potential in serving humans, then every engineer will need to learn more about the liberal arts and every liberal arts major will need to learn more about engineering. While we don’t have a crystal ball that shows us the future, we do know that we’re all going to need to spend more time listening to and learning from each other. We hope that The Future Computed can contribute to this conversation." "The digital currency plunge has wiped billions from the paper fortune of a cryptocurrency billionaire in just a few weeks. Ripple's XRP coin has fallen 74 percent from an all-time high of $3.84 hit on Jan. 4, erasing $44 billion from the holdings of Chris Larsen, co-founder and executive chairman of Ripple. With XRP trading near $1 Wednesday, Larsen now holds the equivalent of just $15.8 billion, according to CNBC calculations using figures from Forbes. Citing sources at Ripple, Forbes said earlier this month that Larsen has 5.19 billion of XRP and a 17 percent stake in the start-up. Ripple holds 61.3 billion of the 100 billion XRP coins in existence." "Apple today announced a new set of investments to build on its commitment to support the American economy and its workforce, concentrated in three areas where Apple has had the greatest impact on job creation: direct employment by Apple, spending and investment with Apple’s domestic suppliers and manufacturers, and fueling the fast-growing app economy which Apple created with iPhone and the App Store. Apple is already responsible for creating and supporting over 2 million jobs across the United States and expects to generate even more jobs as a result of the initiatives being announced today. Combining new investments and Apple’s current pace of spending with domestic suppliers and manufacturers — an estimated $55 billion for 2018 — Apple’s direct contribution to the US economy will be more than $350 billion over the next five years, not including Apple’s ongoing tax payments, the tax revenues generated from employees’ wages and the sale of Apple products." "At Google, we've spent $30 billion improving our infrastructure over three years, and we’re not done yet. From data centers to subsea cables, Google is committed to connecting the world and serving our Cloud customers, and today we’re excited to announce that we’re adding three new submarine cables, and five new regions. Together, these investments further improve our network—the world’s largest—which by some accounts delivers 25% of worldwide internet traffic. Companies like PayPal leverage our network and infrastructure to run their businesses effectively." "But while it can be an efficient way to collaborate, keeping up with Slack can become a full-time task, particularly when you return from a few days away and find thousands of status updates, scattered across dozens of channels. Slack estimates that the average user sends 70 messages per day. How can you know which are must-reads and which can be skipped? Slack’s solution: artificial intelligence. In early 2016, the startup hired Stanford-trained computer scientist Noah Weiss to make the platform smarter and more useful. Over the past year and a half, Weiss’s group has used machine learning to enable faster, more accurate information searches within Slack and identify which unread messages are likely to matter most to each user. Eventually, Weiss aims to make Slack function like your ruthlessly organized, multitasking assistant who knows everything that’s going on and keeps you briefed on only the most salient events." 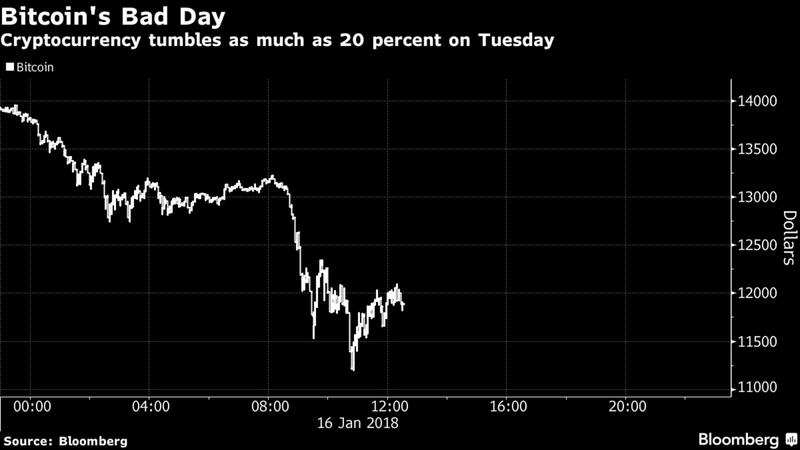 "It’s been a week of reckoning for the cryptomarket, with some $300 billion knocked off its market value in three days. Reports have mounted in various countries of regulators trying to curb an explosion of speculation in digital coins and potential fraud. Meanwhile Bitcoin’s market share is dropping as research increases into rival names -- from Bitcoin Cash and Stellar to sub-$1 billion coins like Ox, Qash, even Golem. “Cryptocurrency holders are trying to decide whether to abandon Bitcoin,” said Steven Englander, head of research and strategy with Rafiki Capital. 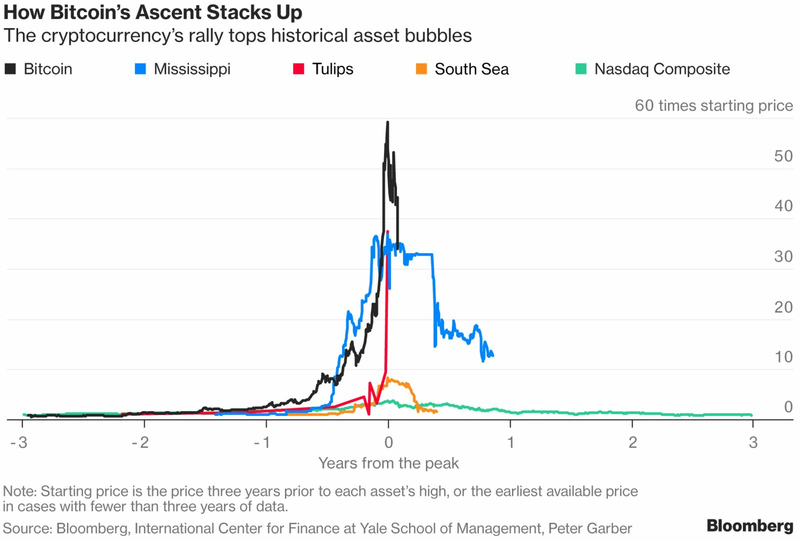 “The dilemma is that once you stop pricing Bitcoin and its derivatives as new assets that will head to the moon, the pricing model is more conventional and much less breathtaking,” he said in a note to clients." "Although the price recovered slightly on Wednesday morning it has still collapsed dramatically since mid December, when it was trading at almost $20,000. Fears of governments cracking down on digital currencies, combined with a wave of panic selling, have led many of them to drop heavily in the last few days. Bitcoin has fallen 25pc in three days while others including Ethereum and Ripple have also suffered heavily. Authorities in China, South Korea and Germany have all indicated they are preparing crackdowns on digital currencies in the coming days. While Bitcoin's price has surged in the last year, many investors and financial regulators have continued to warn about its risk." "Yet even though Apple is not part of the ad business, it exerts lots of control over it. Every tech company needs a presence on the iPhone or iPad; this means that Apple can set the rules for everyone. With a single update to its operating system and its app store, Apple could curb some of the worst excesses in how apps monitor and notify you to keep you hooked (as it has done, for instance, by allowing ad blockers in its mobile devices). And because other smartphone makers tend to copy Apple’s best inventions, whatever it did to curb our dependence on our phones would be widely emulated." "One challenge relates to U.S. intelligence collection. If the Chinese government can recognize every person on the street and easily track a person’s comings and goings, this will make it even harder for foreign intelligence agencies to operate inside the country. Not only will U.S. and other Western intelligence agents be even easier to follow (electronically), but the Chinese government will also be able to identify Chinese nationals who might be working with Western intelligence services—perhaps using machine learning and pattern detection to extract patterns of life. China’s facial recognition efforts thus facilitate its counterintelligence capacities. A second challenge is posed by the fact that this technology surely will spread to other (probably authoritarian) countries. China seems committed to becoming a (maybe the) leader in artificial intelligence, and is promoting startups that focus in this area. No doubt China will seek to export AI technology to other states that seek a high level of government and social control over their populations. Sooner or later, the United States therefore will need to decide what it thinks about the use of pervasive video surveillance and, more specifically, whether this kind of surveillance violates basic human rights norms." "So imagine with me what might happen if Facebook were to become a truly neutral platform — an AWS for attention and identity, if you will. What if the company dedicated itself to a set of stable policies that encouraged other companies to tap into its social graph, its vast identity database, its remarkable engagement machinery? * Instead of squeezing everyone through the monolithic orifice of News Feed, what if Facebook changed the narrative completely, and reshaped itself as a service anyone could tap to create new kinds of value? Facebook could set the rules, take its cut, and watch tens of thousands (millions?!) of applications bloom. More than a few of them, I’d wager, would be extraordinary new interpretations of the News Feed —and because they’d compete in the marketplace of ideas, with individual citizens deciding which of them they’ve decided to consume, Facebook would be off the hook as the sole provider of society’s informational nutrition. Of course this idea is crazy, complex, fraught, and seemingly impossible. But it sure beats the alternative — where one company, and one company alone, is responsible for determining what information the majority of society consumes. No one — Facebook included — seems to want that anymore." "To pass the Senate, backers of the resolution must recruit one more Republican member to their ranks. The measure must survive the Republican-majority House and be signed by President Trump to take effect. After an independent agency makes a decision — such as the FCC's net neutrality deregulation — federal lawmakers have a window of 60 legislative days to reverse the move under the Congressional Review Act. As of last Tuesday, 40 senators had signed on to the resolution to challenge the FCC under the act. Since then, 10 more have joined the effort. Democrats have said they plan to make net neutrality a midterm campaign issue, forcing vulnerable GOP candidates to stand with their party and adopt a position that, according to some surveys, is at odds with that of the broader public." "Bank of America Corp. may not be willing to help customers invest in bitcoin, but that doesn’t mean it isn’t plowing into the technology underlying the cryptocurrency. The Charlotte, North Carolina-based lender has applied for or received at least 43 patents for blockchain, the ledger technology used for verifying and recording transactions that’s at the heart of virtual currencies. It is the largest number among major banks and technology companies, according to a study by EnvisionIP, a New York-based law firm that specializes in analyses of intellectual property." "Dunn may consider his everyday driving habits mundane, but auto and privacy experts suspect that big automakers like Honda see them as anything but. By monitoring his everyday movements, an automaker can vacuum up a massive amount of personal information about someone like Dunn, everything from how fast he drives and how hard he brakes to how much fuel his car uses and the entertainment he prefers. The company can determine where he shops, the weather on his street, how often he wears his seat belt, what he was doing moments before a wreck — even where he likes to eat and how much he weighs. Though drivers may not realize it, tens of millions of American cars are being monitored like Dunn’s, experts say, and the number increases with nearly every new vehicle that is leased or sold." "The challenge isn’t finding these digitized helpers, it is finding people who use them to do much more than they could with the old clock/radio in the bedroom. A management consulting firm recently looked at heavy users of virtual assistants, defined as people who use one more than three times a day. The firm, called Activate, found that the majority of these users turned to virtual assistants to play music, get the weather, set a timer or ask questions. Activate also found that the majority of Alexa users had never used more than the basic apps that come with the device, although Amazon said its data suggested that four out of five registered Alexa customers have used at least one of the more than 30,000 “skills” — third-party apps that tap into Alexa’s voice controls to accomplish tasks — it makes available." "One in six US adults (or around 39 million people) now own a voice-activated smart speaker, according to research from NPR and Edison Research. The Smart Audio Report claims that uptake of these devices over the last three years is “outpacing the adoption rates of smartphones and tablets.” Users spent time using speakers to find restaurants and businesses, playing games, setting timers and alarms, controlling smart home devices, sending messages, ordering food, and listening to music and books. Over half of respondents keep their smart speaker in the living room, followed by the kitchen (21 percent), and master bedroom (19 percent). The survey of just under 2,000 individuals found that the time people spend using their smart speaker replaces time spent with other devices including the radio, smart phone, TV, tablet, computer, and publications like magazines. Over half of respondents also said they use smart speakers even more after the first month of owning one. Around 66 percent of users said they use their speaker to entertain friends and family, mostly to play music but also to ask general questions and check the weather." "Alibaba Group Holding Ltd. put its deep neural network model through its paces last week, asking the AI to provide exact answers to more than 100,000 questions comprising a quiz that’s considered one of the world’s most authoritative machine-reading gauges. The model developed by Alibaba’s Institute of Data Science of Technologies scored 82.44, edging past the 82.304 that rival humans achieved. Alibaba said it’s the first time a machine has out-done a real person in such a contest. Microsoft achieved a similar feat, scoring 82.650 on the same test, but those results were finalized a day after Alibaba’s, the company said." And the third are the cynics who want to capitalize on the current craze by pretending their businesses are really bitcoin ones, and bidding up the stocks of ones that do engage in such fancy. That, after all, is how such non-cutting edge companies as Kodak and the Long Island Iced Tea Company both managed to triple in value in a matter of days. It's just musical chairs for grown-ups: everyone knows this is nonsense, but everyone thinks they can be the second-to-last person to sell." "Facebook came up with glowing new products like Newsfeed, Instant Articles, and Facebook Live, providing silly advice for thriving on the platform (“Play on emotion, folks, users love it! — Hem, this might be difficult, we are business news providers…”). Facebook promised a deluge of eyeballs. Caught in the headlights, deer-like publishers silenced their mental warning that said to look deeper, and gave up loads of content in exchange for nearly nothing. After investing significantly in dedicated teams to produce, promote, and strategize their presence on Facebook, publishers of editorial quality were left with hemorrhaging viewerships and a trickle of revenue. (A group of profusely funded media innovators like BuzzFeed, Vice and others —who cleverly designed their products to blend neatly into Facebook—started out doing well, but now face disappointment). Those who imagined Las Vegas, now find themselves stuck in Detroit." "Media will feel the sting, but it’s for the best. And on some level, media knows it. The hostile coverage of Silicon Valley these past few months reflects a certain psychodrama. For years, media has resented its dependence on Facebook and Google, yet it suppressed any vitriolic sentiments. These companies carried such cultural prestige, and media felt so enslaved to them, that it broadly restrained their venting of their complaints. With the election of Trump, all of media’s pent up rage came pouring into the opinion. It was suddenly acceptable to bash these companies. Every day, the big newspaper seemed to publish a new critical expose of them. But instead of clobbering Facebook one more time, media should now thank it. Facebook has just done media the biggest favor of them all. It has forced media to face the fact that digital advertising and ever-growing web traffic will never sustain the industry, especially if that traffic comes from monopolies like Facebook hoping to claim the entirety of digital advertising dollars for themselves. Media can’t deny this, but it doesn’t want to sustain the pain and heartbreak that comes with transition; and it’s reluctant to relent the notion that it might exploit Facebook to achieve global scale. Now, Zuckerberg has broken that too—and freed media from a delusion that it should have discarded long ago." "The spying initiatives Snowden brought to light are authorized under Section 702 of the 2008 FISA Amendments Act, which was set to expire later this month. On Thursday, Congress voted down an effort to reform Section 702, and instead passed a bill that expanded warrantless surveillance of US citizens and foreigners. The newly passed bill reauthorizes Section 702 for six years, long after President Trump’s first term in office will have expired. The amendment that the House of Representatives shot down would have added significant privacy safeguards to the law, including the requirement that intelligence agents get a warrant in many cases before searching through emails and other digital communications belonging to US citizens. The bill Congress did pass, meanwhile, codifies some of the most troubling aspects of Section 702, according to privacy advocates. The legislation still needs to pass in the Senate, where fewer representatives are interested in significantly reforming the law."